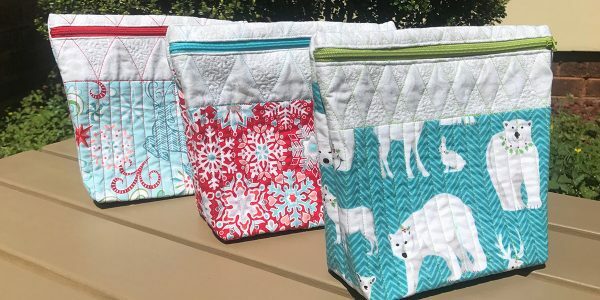 Handmade Gifts for Friends That Sew + Giveaway! Are you looking for handmade gift ideas for family or friends (or even quilt guild mates) that sew? From simple to sew pretty pincushions to over-sized project tote bags we’ve gathered together our favorite handmade gift ideas for sewists right here. As a special treat we’ve got a fun giveaway for you at the end of the post! These adorable little Christmas ornament pincushions are a great gift for any sewing friend! Gather up a few favorite holiday fabrics and you can whip up a few in no time. Click here to find the free, downloadable template and tutorial to make a DIY Holiday Ornament Pincushion. 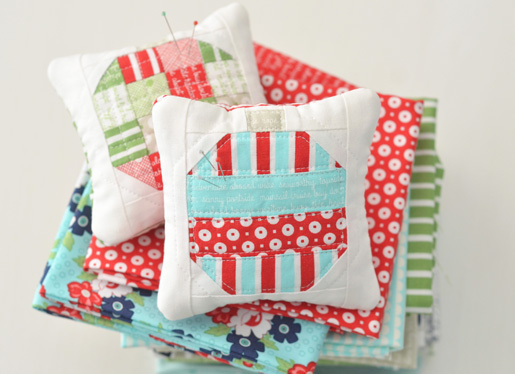 Find even more free tutorials for creating fun pincushions at our WeAllSew Pincushion Party post! 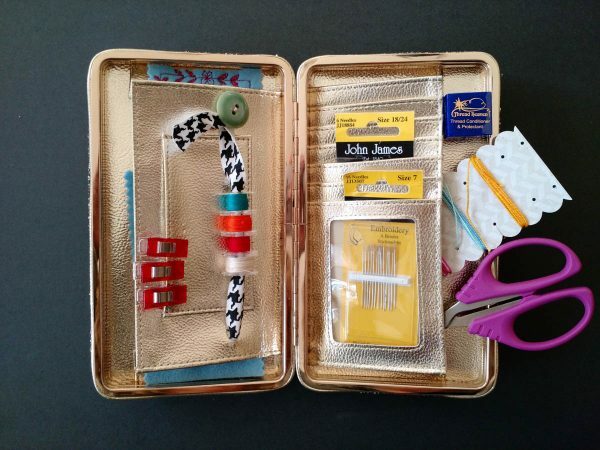 Amanda Leins came up with the most clever idea for creating a fun hand sewing kit from a small cluch! With a few modifications, turn any small pocketbook into a fun hand sewing kit, the perfect gift for anyone who sews. Find the tutorial to make a Sewing Travel Kit here! 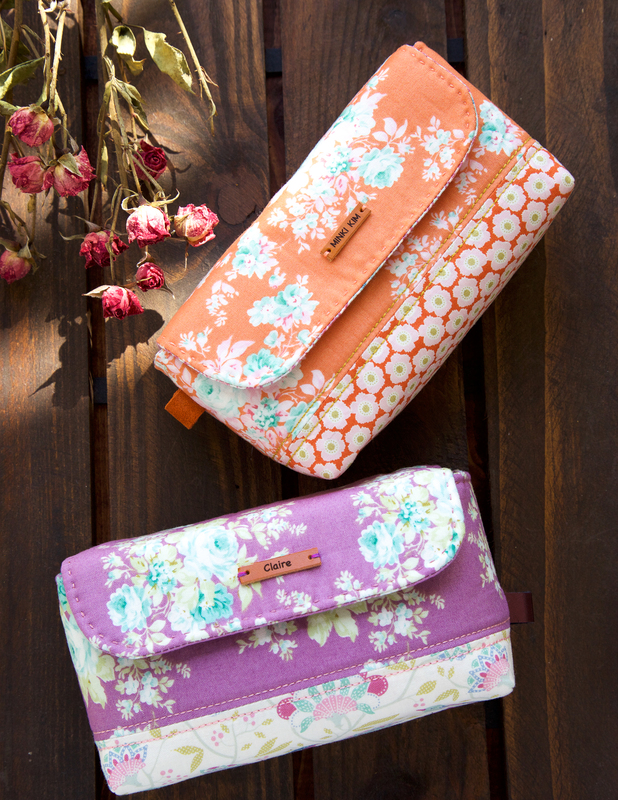 Zippered pouches are always welcome gifts for any sewist or crafter! 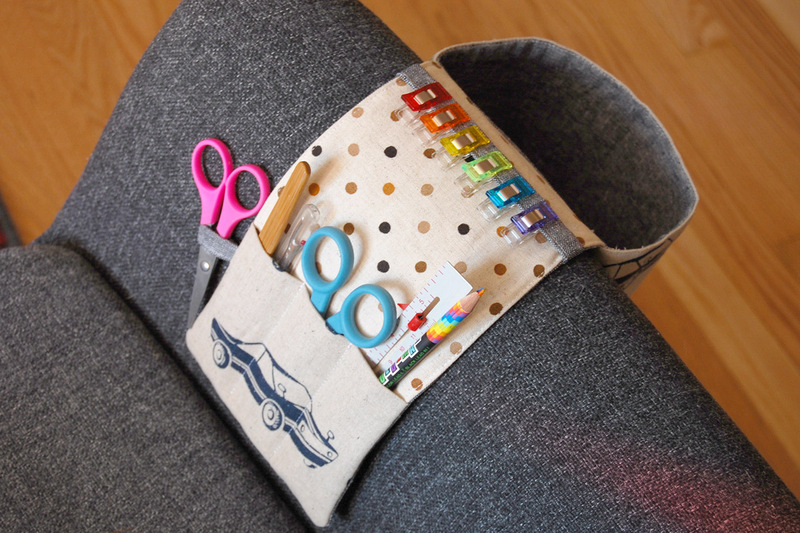 These little zip pouches are a clever use of practicing free-motion stitching with rulerwork. Learn how to make Zippered Rulerwork Bags here. This little book has several wool felt “pages” to keep track of needles and pins, and it makes a great gift! Stitch up a Wool Appliqué Needle Book with this how-to at WeAllSew. This pouch is the perfect size to hold hand sewing tools such as scissors, seam ripper, thread, gluestick, eyeglasses, and more. Learn how to make a sweet Stationery Pouch with this tutorial. If you have a friend who is in need of an oversized bag to tote quilts, knitting projects, or other craft supplies, this colorful and extra large tote makes the perfect gift! 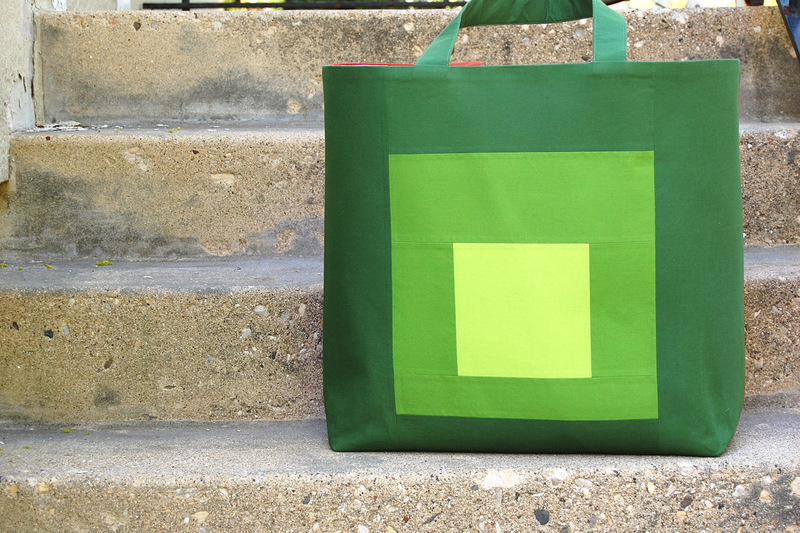 Find the tutorial to make a Color Block Tote Bag here. 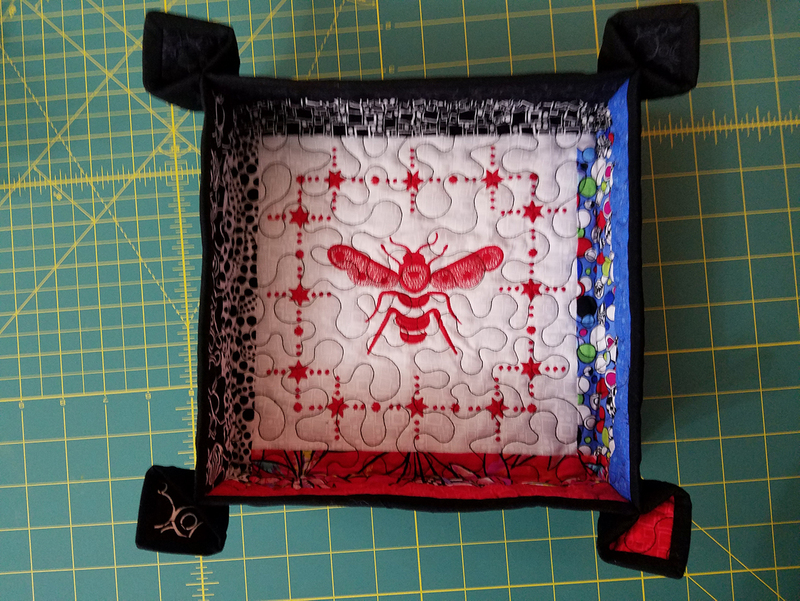 Use a small quilt block or piece of quilted fabric to stitch a quick catch-all tray, perfect for corralling notions by the sewing machine or hand sewing supplies by a favorite chair. Click to find the Quilted Tray Tutorial here. 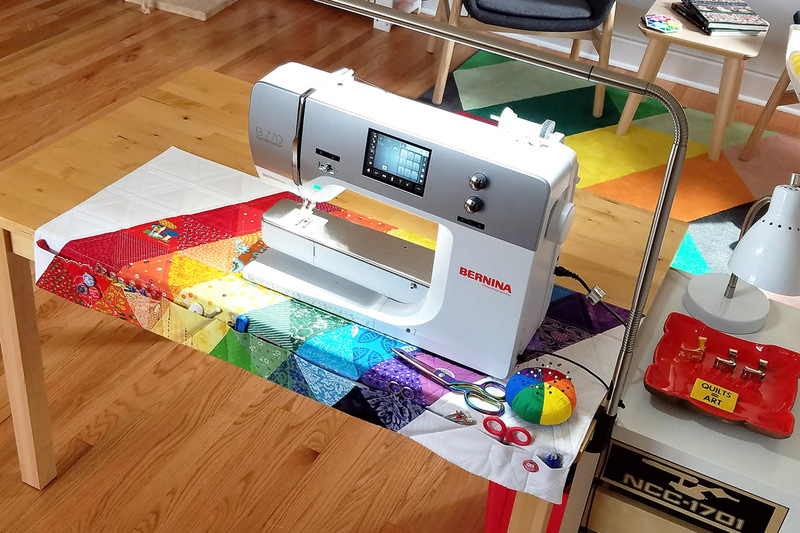 This over-sized sewing machine mat incorporates a front row of pockets to hold most-used tools while sewing, and creates a quilted area to protect the table top from scissors and pins. 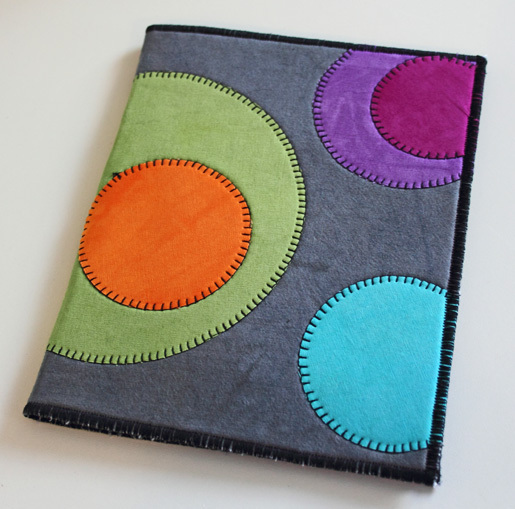 Learn how to sew a Sewing Machine Mat here. 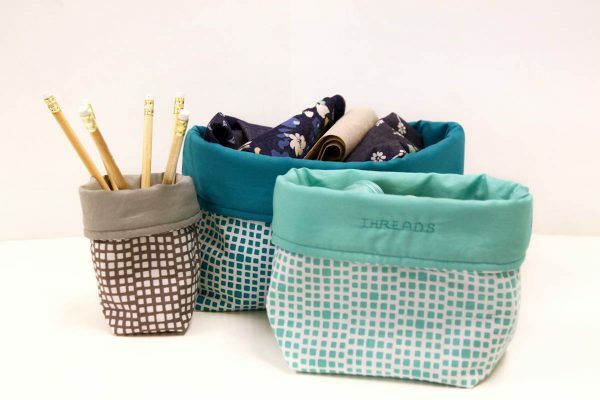 This fun set of fabric bins can be made in three sizes to hold any number of sewing and crafting supplies, a great gift for any creative friend. Find the Fabric Bin Tutorial here at WeAllSew. If you are looking for a simple gift for anyone who does some hand sewing, this thread catcher with attached tool caddy is just the thing! It holds snips, pins, and any other tools needed for hand stitching, and offers a large thread catcher to catch bits and snips of thread. Learn how to make the Tool Caddy Thread Catcher here. You won’t believe how fast these little baskets stitch together! Who wouldn’t love a sweet handmade basket to hold notions by their sewing machine? 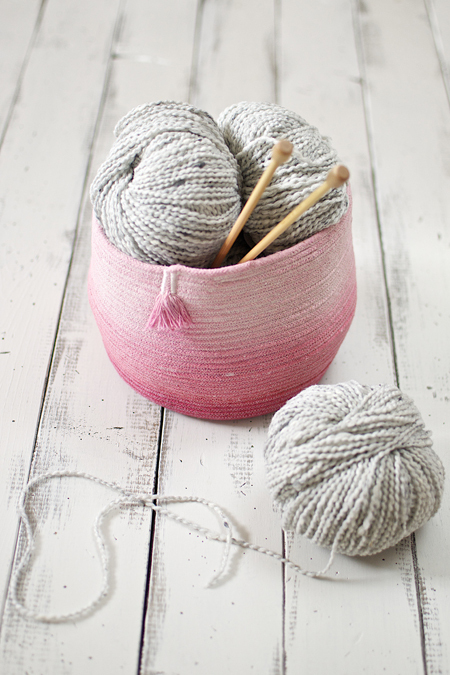 You can find out how to make a simple Coiled Rope Basket here. One lucky WeAllSew reader will win this fun prize package including one Reverse-A-Rule triangle ruler, one pair of Tula Pink 6″ Bent Trimmers, and one BERNINA tote bag! The giveaway is open through Thursday, December 13th, 2018. The giveaway is open to residents of the 50 United States and the District of Columbia. One comment per fan. 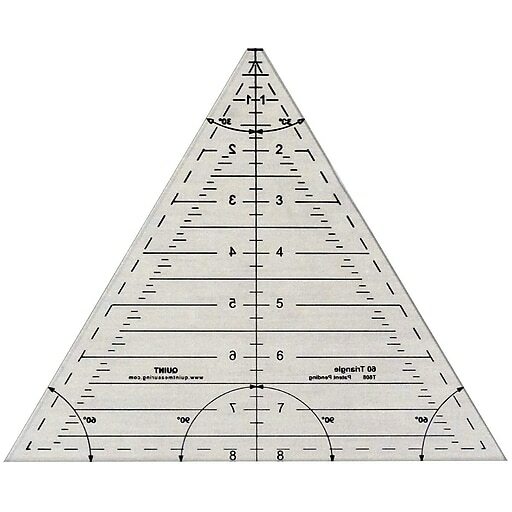 Comment must be submitted to the WeAllSew.com blog by Thursday, December 13, 2018 at 11:59 PM Central Time. Winner will be chosen randomly. Winner will be notified by email and will have 48 hours to contact to claim the prize. The best handmade Christmas gift I’ve ever received was a little angel doll ornament that I got from my best friend years ago. She hangs in my kitchen throughout the year because I couldn’t bear to put it away at the end of the season. The best Christmas gift was a gold velvet dress with lace trimming around the collar and sleeves that my mom made for me when I was 9 years old. She gave me the gift of learning to sew as well. She had a pink Montgomery Ward sewing machine that she taught me to use. My first sewing machine was the 1974 Bernina 830. Have a 2001 Activa 145 now. I have two favorite handmade gifts, one was thread catcher to have next to my machine that a friend gave me when I took her on a tour of the local quilting/sewing stores, The second is a tree ornament that a friend made after I took her to a Bernina class at our local store. It was her first attempt after getting her embroidery machine. An elf Christmas ornament from my Grandmother. I still hang it on the tree every year. My uncle made me a handtooled leather coin pouch. It’s ancient, but I still treasure it. I treasure the crochet bedspreads and table covers my mother has given me over the years! My mother made me so many lovely needlepoint gifts that it’s hard to choose, but my favorites are the Christmas ornaments that she gave to me and her grandchildren. Every year when I take them out I remember how much love went into those ornaments. My favorite is doll clothes that my mother, a non-sewer, carefully made one Christmas. My favorite handmade gift I’ve ever received is a canvas with my grandson’s handprints painted in a heart shape with “Grandmother’s hold our tiny hands for just a little while, but our hearts forever” printed around it (my son did the printing). A quilt that my mother passed down to me made by my great aunt! Favorite gift I received was a handmade monogramed telephone book cover. No kidding. It’s going to last forever since I seldom use the telephone book. It’s the thought that counts🙂. Small needlepoint scissor holder. 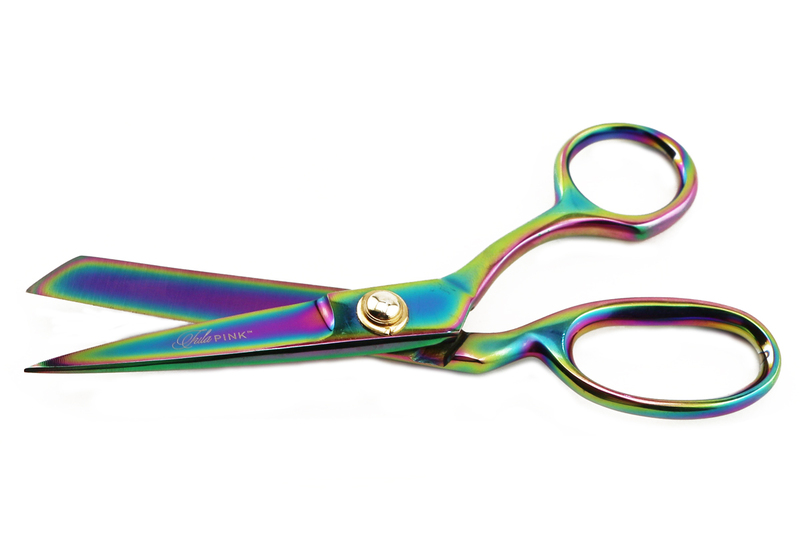 I use them all the time when I travel – can easily find my embroidery scissors. Love this needlepoint case my sister made for me! My sister took a photo of our whimsical outdoor melamine dishes, and transferred the design to make a hooked kitchen area rug matching the colors and design. My favorite hand-made gift that I have ever received was a small, fold-up needle holder, which I use for my hand sewing needles on one side; slightly used machine needles, on the other side. I also keep my favorite thimble in the middle, so that I always know where it is. I would have to say the first quilt my grandmother ever gave me…………. Travel bag made by my cousin! My favorite Handmade gift was a hand-quilted quilt from my mother…it was one she had started before she was married! I treasure it. I love the We all Sew Blog! My sister made the most beautiful teapot quilt for me. The applique handwork is stunning. Years ago, my sister gave me a sand filled pin/needle holder, with attached waste bin for cut threads, empty spools,etc.. I don’t think I could sew without it now! My favorite handmade gift was from a high school friend. She started making me a YoYo quilt. As she started running out of time she got her whole family to help her get it done in time. I will always remember it with love. It would have to be a quilt. My mom (lucky me) is a quilter and she made a darling “cat” quilt that was published in Better Homes and Gardens probably 40 years ago. She made it for me to take to college and I still have it and love it to this day! Thanks for sharing the chance at an awesome giveaway!! My most memorable hand-made gift was a set of pajamas my mom made me when she was bed-ridden in a hospital bed. Every stitch was added by hand and I wore those jammies til I outgrew them! I’ve always been partial to the ornaments my children made every year at school. 40 years later they are still on my tree. I love to make ornaments and other small(ish) items like table runners, pillows and mats that help to make homes more festive. My favorite handmade gift was small felt mitten Christmas ornaments made by my mother-in-law tied together with a ribbon! My favorite gift was a simple drawstring bag that closed with a silk ribbon. My grandmother made it for me to keep my marbles in when i was in elementary school. It was seen entirely by hand. My favorite handmade gifts that I have ever received were these cross-stitched Christmas ornaments from my Aunt Nita. She would make these every year and pass them out at our annual Thanksgiving dinner. Most people would sit them down of the gift giveaway table where the white elephant gifts and other small give aways were and I would always pick them up along with her knitted potholders. I adored these items. I had an entire Christmas tree decorated with these small but precisely cross-stitched lovelies. Aunt Nita passed away two years ago. I am sad now knowing there will not be anymore decorations to add to my Aunt Nita tree. I like to make holiday table runners. It gives me the opportunity to practice new techniques before attempting a larger project. I think my very favorite was a coat my grandma made me when I was young, I wore it until I was to big for it. I just received a basket made with clothesline. Love It! Cross stitched Christmas stockings made by my grandma! A beaded necklace from my daughter. Our quilt guild has Secret sisters and mine knew my passion for horses and I received horse coasters, pillow and a beautiful horsey apron. Thanks, Rita! That is a hard question to answer but I will say that love the memory book my sister created for me for my birthday. A baby quilt made by my husband’s 94 year old great grandmother. A quilted Christmas-themed table runner! fabulous prizes. thanks for the chance to win! After my husband and I were first married, we purchased the first sewing machine – He made a beautiful sewing table with drop sides to expand to 8 feet! I still use this table today – 45 years later. But now I have upgraded to my beloved Bessie – my 790Plus. Although he has made other things for me through the years this is by far my favorite. This page is full of fun ideas. Thank you! When my mom retired, she start d quilting, and she made a couple of beautiful appliqué quilts, my favorite was a hummingbird and flowered quilt..I kept telling her I wanted it and she told me she’d leave it to me in her will. But then that Christmas she gave it to me for Christmas! I cried when I opened it. I will always treasure that quilt. My favorite handmade gift is a quilt made for me by an internet blogging buddy in England! We may have never met IRL, but she is a dear friend and I cherish the quilt she made me. I received a pin cushion made with a piece of material from my biological mother’s housecoat. She was deceased..
My sister knitted a beautiful afghan for me. My favorite handmade gift was a Sunbonnet Sue quilt that I had as a child, made by my “Auntie”. Hand appliqued, hand quilted, each “Sue” had a name of one of my friends embroidered on it. I loved that beautiful quilt, made in 1935. I love the larger sewing machine mat with diagonal pattern. Can’t wait to make it. Favorite handmade gift that I have received was a Christmas tree skirt. A queen-size, crocheted bed cover made for me by my grandmother. It was much loved as was she. My favorite handmade gift was a tote bag my friend made from batiks. I think my favorite is a doll quilt which my grandmother made for me. I recently discovered that the pattern is called Grandmother’s Flower Garden, & I believe it was all hand-sewn. My own granddaughters now play with this quilt. The binding was very worn, so last year I removed it, squared it up, & put on a new binding, which I hope will last for several more generations. My uncle hand carved and hand polished an ivory heart for me. My favorite hand made gifts I have been given are the handprints, paper flowers and other masterpieces from my children’s childhoods? My husband got me a sewing machine. I have two. One is a sunbonnet quilt that my great grandma made for me when I was a young girl. The other is my baby’s Fayette OUTFIT that my Gram crocheted for me that I wore home from the hospital. My mother made me a counted cross-stitch picture of bears doing all kinds of exercise. I still have it! The gifts I treasure most are the Christmas ornaments that my children made for me! I always think of the rag doll and black velvet teddy bear my Mom made for me. My mom loved loved loved to sew! Our high school back in the day had a sewing classroom and there were adult classes at night. Mom made me a lined wool cape that I wish I still had. I think that is my favorite gift recieved. That and the gift of creativity!!! both my grandmas were crafty. One was a superb crocheter and seamstress, the other did needlepoint and toile painting. I have special gifts from both – a framed needlepoint picture from one, and a crocheted bedspread from the other. How lucky was I ? Chrismons through the years from my grandmother, and a Christmas tree skirt from my mother for my first apartment. My favorite handmade gift is the quilt my grandmother made me many years ago. She also taught me how to quilt. When my daughter was about 10 years old, she made me a pair of slippers out of some bright red fake fur. They were quite festive, and they fit well, although they were shaped a bit differently, one from the other. I was completely surprised, too–I didn’t know she had been working on them. Anything home made but especially love the crocheted bed spread my sister made me, huge latch hook rug from my grandmother & beautiful quilt from my honorary grandmother. My friend gave me the most adorable hand felted pin cushion that resembled a tree stump and she added in an adorable pin set with handmade toppers (a mushroom, a bluebird, a bird’s nest and a strawberry). A wonderful gift! Hard to pick a favorite but I do like the sign for our farm that my son and his wife made. My favorite handmade gifts are anything sewing related. Pin cushions…knit scarves…a gourd basket. So many items bring fond memories. My best gift , hand-made, was a crocheted angel ornament !! It graces my Christmas tree every year!!! It’s about 40 years old!!! I have received many handmade gifts – all lovely – a sewing table my husband built, beautiful hand carved necklace and more but my very favorite is a pottery spoon rest my grand daughter painted when she was six – I still use it today and she is now 15 . The favorite handmade gift that I have ever received was a quilt from my mom! I still love and use the Christmas stocking my mother made for me when I was 7, 63 years ago! The best hand-made gift was a scarf knit by the neighbor down the street. Every year she had a special present just for me. The scarf came during my teenage years and and it was the best for keeping out the cold. It went to college and years beyond. I remember this neighbor with great fondness and hope to be as kind and generous as she. My mother embroidered dozens of dish towels and pillowcases for me. I use the pillowcases regularly, but since she’s passed away I can’t bear to use the dish towels. I enjoy visiting them and remember the memories, but don’t want to wear them out. A friend gave me a homemade pin cushion that was tatted as a thank you for teaching her how to knit socks. The hand knit Christmas stocking that my Mom made when was little. It was a Santa Claus with his beard knit with mohair yarn. A “self-portrait” wall hanging my grandson made for me. Other than the handmade gifts my children made for me when they were little which I loved, I don’t think I’ve received a handmade gift. Maybe that will change this year as I’m giving my granddaughter a sewing machine for Christmas. One of my favorite hand-made gifts, among the many, was a surprise-made wool quilt Mom made for my wedding. I lived with her and didn’t know anything about it! I still use it every winter, lots of years later. My favorite handmade gift is a quilt made by my aunt as a wedding gift. One of my favorite things is a kitchen quote a friend handlettered and framed for me many years ago. It’s in my kitchen today and makes me smile to think of her. My favorite little gift was designed and sewn by my mother many many years ago. It was a tiny envelope-like holder for those small packets of tissues. It even had a little snap to hold it closed. The Christmas ornaments my children made when they were younger are my favorite gifts. Plaster of Paris handprints my boys made in preschool. They’re now 44 & 41. Still have them. My most favorite handmade item was given to me three years ago by my granddaughter, Claire. It was a blanket throw with fleece on one side and cotton fabric on the other with little rosebuds. She trimmed it in beautiful cotton lace. It saw me through a difficult back surgery, which offered comfort and warmth. I use it every night during the winter. In fact I’m wrapped in it now! At age twenty two this was one of her first endeavors!! I will cherish it always. 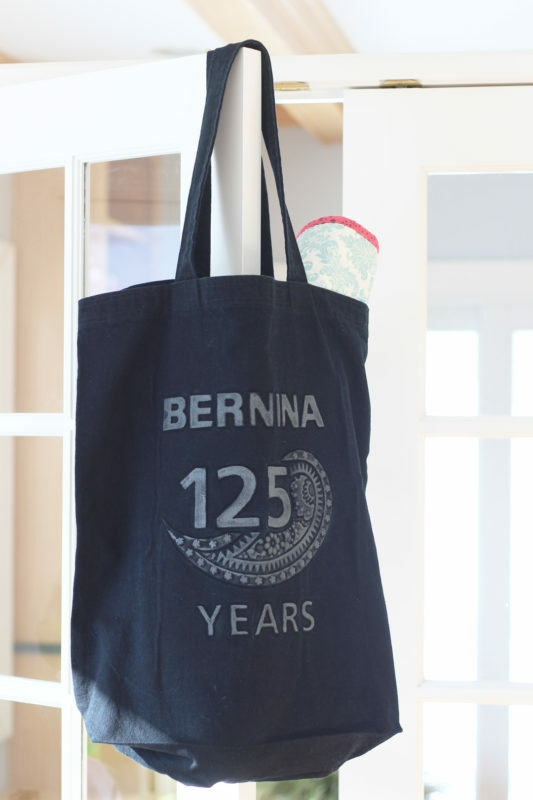 I have promised to put my Bernina sewing machine in my will so that nobody gets it but her!! She needs to sew on the finest machine there is. My fave hand made gift to receive was from my friend and quilting mentor. She created two beautiful painted porcelain crosses for me. My oldest niece (then 8 years old, now 55 years old) made me a small, pink macrame owl. I still have it hanging on the wall in my sewing room. She now owns and operates a fiber farm and shop. How we love our textiles! The only decorative needlework my grandmothers did was crocheting doilies. I treasure those doilies. I framed one from each grandmother and display them on my wall. Flannel pjs that my mother made for me, my husband, our three little boys and our little girl. They all fit perfectly! My father-in-law made me a little wooden picnic table with holes on top to hold catsup and mustard bottles, as well as a matching paper napkin holder. That was about 50 years ago! Years ago I received my first quilted gift. It was a tree skirt, hand made and sent by a friend from across the country. A complete surprise.. Every year, at Christmas, I am reminded of her thoughtfulness, and generosity when I set my tree up. My favorite hand made gifts have been the clay creations from my grandchildren. My favorite handmade gifts have always been things my children made for me – from snowglobes to ornaments to picture frames. I still have them all and my children are all grown. My favorite handmade gift was from my sister – a tote bag and matching journal with Mickey Mouse fabric! My favorite hand made gifts I have been given are the ones made by my children because they were made out of love. There was a wide range of gifts over the years from homemade Christmas ornaments, hand prints in clay, planted flowers in a milk carton as a pot, and flower vases made out of a pop bottle to name a few. And as they got older they learned to do to make many adorable gifts out of plastic canvas like tissue covers or wall hangings. My mom made me several dolls when I was little. I was always fascinated by how she did the yarn hair. I also treasure the quilt my mother-in-law made for my husband and me. I have never had the please of receiving a hand made Christmas gift, however I have given a few, usually embroidered scissor cases on my 830. I have special gifts of handmade ornaments my son and daughter made while in grade school, the ” special” shopping they got to do at there elementary school for Xmas each year for their family, memories of quilts and other crafts we did together. The quilting class my son took and made his dad and I a queen size quilt. My daughter designing and making her first quilt for her bed. The love and happiness of sharing my creativity with my son and daughter and inspiring them to create. These are all precious gifts to me. Wow. That is amazing. Great parenting, encouraging their creativity!!! One year my sister made each of us siblings an intricately pieced quilt she had made (I have 10 siblings). She made them the size of our beds and the colors we preferred. That was an amazing Christmas gift for one person, but she did it for 10 people! Our family had a tradition of giving a special present to the person who decorated the back of the tree. This present was from a Christmas elf named Bengi. My aunt made each family a hand made elf. Bengi sat upon the present Christmas morning. My 40+ year old children still compete for this gift. I have a friend who I give batting scraps to. I didnt know it but she makes trivets out of old blue jeans and the batting. How cool is that for repurposing? It is heavy duty and protects your dining table from hot dishes from the oven! Thanks! My grandmother made me a flying geese quilt for my bed! it ws beautiful and one of the last quilts she ever made. My mom would sometimes make my sisters and me clothes. Usually they were just everyday clothes. But I remember one year when she made us all long, velvet dresses. We really felt special when we wore those to Christmas events. My favorite handmade gift would have to be the quilt my great grandmother made. My mother gifted it to me, as her mother had gifted it to her. It is a white quilt with a beautiful navy blue star in the middle. It is of course all hand sewn and I always marvel at how they could maintain such even stitches. I have two favorite hand made gifts. I was gifted two clothes pin ornaments by a cousin. One ornament is a reindeer and the other one is a soldier. The ornaments have added a touch of whimsy to our Christmas tree for many years. My favorite handmade gift is a beautiful stain glass window hanging. A lady I worked with when I was in college created stain glass items as a hobby. The hanging has a coral colored tulip in the center with rust, off white, and red glass fitted around the tulip. I still have it after 35 years and have always found a place for it to hang in every home I’ve lived. It is a treasure! The best handmade gift I have received was a chicken shaped pin cushion. My dear friend took a class just to be able to make it for me. It roosts on a shelf watching over me when I’m sewing. After I graduated from nursing school, my mother cross-stitched a sweatshirt for me that said “NURSE.” Each letter was something related to nursing. For example, the U looked like a stethoscope! My favorite handmade gifts are things my students make for me – I teach middle school, and some of my students are incredibly creative! My son made character dolls out of felt for me.They ride in my vehicle with me. A papermache creche made by nuns I received in gradeschool. I still display it more than 50 yrs later! My favorite was a set of Barbie doll clothes my sweet grandmother made that included prom dresses and evening wear, beach wear and skirts and blouses. The best gift I’ve received was a hand carved (walnut) wood pin. It is heart shaped and has flowers and leaves on the front. It was from my boyfriend, whom I was married to for 45 years. A real treasure from someone who has passed on. As a young girl, Mother knit a sweater for my Barbie. While she had taught me to sew, I didn’t know she could knit. It was, and is, a special gift – not just the sweater, but my appreciation of her talents. A Christmas stocking embroidered and sequined by my mother. My favorite hand made gift will always be the prom dress my Grandmother made for me. It was beautiful and every stitch was made with my Grandmother’s love. My favorite handmade gift was hand sewn doll from my aunt that lived way up north. I live way down south and she came to visit one summer and brought the doll for me to have. She passed away with cancer and I keep this doll on my sewing counter as a reminder of her! My favorite handmade gift you have ever is a little change purse/wallet that can hold my money and cards. It has a small wrist strap and I find myself using it all the time instead of carrying a purse. It’s made out of a vintage fabric I love! I loved all the handmade gifts my daughter made at school each year. Now I am enjoying the homemade pumpkin bread and goodies I get from my granddaughters each Christmas. The best handmade gift I have ever received were stockings for my twins. My grandmother made me a stocking over 50 years ago. When my boys were born my mom made 2 stockings for them that were very similar to mine. They hang in my home every year! My favorite handmade gift was a sweater made by my mother. I thumbed through a pattern book one day, my eyes lingered on one sweater briefly, and there it was under the tree that year. Priceless! 40 plus years for Christmas, Mom made all of us kids (6 grown adults, full size appliqued hand quilted quilts. My Dad also helped quilt them so it was double special. Each one was a different design – what a great remembrance of my Mom and Dad. My favorite hand made gift was given to me from my frugal sister in law. In fact she had the saying “Use it up wear it out, make it do or do without “ painted across, all around the top of her farmhouse kitchen. She is an eight year survivor of a double lung transplant. She made for me a heart sachet made out of scraps and bits of her stash. It has old pieces of doily, small pearls, bits of lace, etc. with the meds she takes her hands shake and she has become very frail but onward she continues with her masterful sewing skills and continues to help me grow in mine. I keep it on my vanity so I get to enjoy it daily. Since I cannot post a picture of it here I made it my profile picture. My favorite is a fuzzy scarf my sister crocheted. When I was a nurse-midwife my clients often had long waits in the clinic. Some gossiped, some read, others dozed but one of them spent her time crocheting a beautiful pink & white Afghan for me. I was overcome with emotion. I still use it and her “baby” must be about 20 now. My favorite handmade gifts were the ornaments that my kids made in school for our Christmas presents. Still put them on the tree every year even though the oldest is 40. A mosaic trivet my daughter made me when she was young. Hangs above my range, in a place of honour. My husband made several wooden things— jewelry box and container for sewing supplies. I love them and I know he put lots of effort into each. I love my pin cushion/trash bag that hangs on my sewing table. Made by my guild as a going away gift. My hand hooked rug made for me by my Dad after he fell ill. I keep it on my side of the bed so it is happy to think of him daily. My green, orange, and white afghan that my mom crocheted for me when I was in school. (1969-1977) I don’t remember year! They were my favorite colors. Terrible dated but I love it in my chair! My friend is very creative and has made me several handmade gifts including pin cushions, bags, etc. my favorite one is a small bag she made me with plastic on the front that allows me to see all my tools inside and my name embroidered on the front. On the zipper pull she spelled out my name in little beads so no one could ever accidentally mistake my bag for theirs! A knitted Christmas stocking by my mother. I still cherish it and look forward to hanging it up every year. My favorite of all time hand made gift was when I was 6. I received from Santa a doll and truck and my mom filled it with hand made clothes. I played with that doll and truck full of clothes for years! Didn’t know then what a labor of love that gift was! A hand painted “nap” quilt with hummingbirds, wild flowers, butterflies, and . . . . made by my BQF. Mom crafted a tree skirt for us. Large red felt circle, lots of sequined decorations with our names in glitter paint. Decades later it’s not Christmas without it. She was not a crafter nor a sewing enthusiast but she enjoyed making this one. Miss her. My favorite handmade gift I have received was a quilt when I graduated from high school. Made by my aunt, I carried it through college, marriage and my own children and grandchildren. All of us at one time or the other have cuddled under it. It has been repaired a few times, but it still is a comfort. My favorite handmade gift was a quilt given to me as a wedding present. I didn’t realize all the hard work that went into making it until I started quilting several years ago. It has made me appreciate it even more. My mother made me a corduroy jumper that took her a long time because she wasn’t an experienced sewer. I loved it! Best homemade gift ever got was a hand sewn quilt from my grandmother. Which I still have and treasure. Because my mother and grandmother were both seamstresses, I received many beautiful gifts from them. But one of my favorite gifts was a pieced, hand-quilted bedspread from my husband’s aunt for our wedding. I was touched that someone I hardly knew would spend that much time on me. An apron, that I use every day. A hand made ornament every year for each of my children from my Mom with their name and the year embroidered on the back – each of them has 20 ornaments. I am now trying to follow the tradition with my grandchildren. My favorite gift is a small fabric basket. a Christmas table runner made by a dear friend. My favorite handmade gift was a bib made by my Mother. She was always dropping food on or down in her blouse at the dinner table. She made all the girls a bib and it reminds me of her fishing food out of her bra and laughing. The most wonderful, favorite handmade gift I ever received was a set of crochet bowl warmers. Similar to the fabric microwave bowl warmers, but crochet to resemble a flower. Best gift ever, since these were made by my mother’s hands. Merry Christmas and Happy New Year! One of my favorite handmade gifts is a folder needle book that opens up like a flower. I have received many home made items and love them all. The best was a oven mitt with my great granddaughters hand print, name and year . It hangs in my kitchen and I just love it. My mother-in-law made my husband and I a crocheted blanket for our bed . It was completed 25 years ago, but still in use. My favorite Handmade Christmas gift is all of the handmade ornaments that my Mother and my 4 Sisters and I used to make and exchange each Christmas. I received a quilt that my daughter made. She made 4 identical quilts that represented me, her two sisters and herself. Of my three girls she is the only one who sews and she caught the quilting bug. I love sharing this wonderful hobby with her. My best was a pair of hand embroiderd pillow cases from my grandmother. As a teenager, I was blessed at Christmas to receive a handpacked box of several beautiful new outfits that my mom had sewn. She would carefully choose the fabric, to go with new patterns, that always looked nice on me. I would receive wool skirts, blouses, dresses that were so pretty and very much in style. I just recently told my Mom, once again, how special that gift always was for me! My grandmother made me a crochet afghan when I was a teenager, she is gone, but many years later I still have and use this afghan which is one of my most precious possessions. A pillow made from my Dad’s faux suede shirt with a pocket for TV remote and embroidery writing “Think of me when you use this remote control pillow. My most favorite handmade gift was given to me by my mother when I was a little girl. She made me a pioneer dress for my favorite little doll. My mother is no longer with me, but I do still have that doll with her pioneer dress. The dress is showing it’s age it looks a little ragged – or a little loved. I am a mother myself (mine is 22 years old), and I do make homemade gifts myself for my son. My friend makes me the cutest mug rugs for all the seasons. I love them and think about her when I use them. The best homemade gift I’ve ever received was an Afghan my mother made for me. My granddaughter now loves this too as it is the softest Afghan ever! My Great Grandmother made a Double Wedding Ring quilt because when I was a little girl I used to trace the circles and marvel at all the different fabrics she used. She made this at least a decade before I was married but when I got married my grandmother gave the quilt to me. It brought tears to my eyes when I opened the gift, knowing that in a way my great grandmother was there in spirit. The best gift I ever received was a hand sewn and quilted double wedding ring quilt which was made by my mother and her mother. It was probably made before I was born It was given to me for Christmas one year shortly after I was married in 1969. I treasure it. I hope to pass it on to a someone who will appreciate it. I have three sons who don’t particularly care for quilts so it will have to go to a granddaughter. My granny made a cloth doll for me when I was very small. She made hair from yarn and clothes from whatever scraps she had handy. Granny embroidered her eyes, nose and a mouth, and I named my doll Susie. I still have Susie, who is over 60 years old. She is in good condition, and I remember my granny whenever I see Susie! I treasure the beautifully hand-embroidered tablecloth that my mother made for me many years ago. It’s definitely my favorite handmade Christmas gift. I would have to say my favorite handmade gift is a red Christmas stocking with my initial “C” in white made by my aunt when I was a little girl in the 1950’s. My most cherished hand made gift is a wall hanging quilt a friend made for me in my favorite colors to celebrate my adult Bat Mitzvah. My youngest sister (RIP) made me a quilt. You can feel the love in every stitch. I cherish a crocheted Christmas wreath pin that my grandmother made when I was 10. And the hand embroidered dish towels. And the crocheted pot holders from my great grandmother. My best gift was a sweatshirt that my DIL decorated for me. She wrote on the front “my grandchildren walk all over me.” On the back she covered their cute little feet with paint (is that child abuse these days) and stamped their feet all over the back. Around the neck she put puffy paint and placed “pearls.” My oldest grandchild is 29 and I’m still wearing the shirt. The very best handmade Christmas gift I ever received was given to me several years ago when I was about 8 years old. My grandmother always made the most beautiful quilts and I kept asking for one. One Christmas morning I woke to find the best Christmas gift for me under our tree. My grandmother had made outfits for a Shirley Temple doll and a gorgeous and fantastic quilt just for Shirley. My favorite handmade gift is a wooden chest that my husband made for me entirely in secret. He didn’t have any woodworking tools, so he crafted it during his lunchtimes at work so I’d be nonethewiser (he’s a military guy and there was a woodshop on base). It was a huge surprise! My best was place mats from a dear friend who does not enjoy sewing but made them anyway. A friend made me a tote bag that I use all the time. It’s lovely! My mother in law made me so many homemade gifts over 30 plus years. My favorite is the wreaths she made of little wrapped presents! I had to fix the backing which completely Disintegrated cardboard and she made her own tiny bows. I still love them as much as when I received them! When being transferred to a different state, a group of friends created a quilt for me. Each person created a block with a heartfelt message, and then all blocks were made into a keepsake quilt. My most favorite would have to be the embroidered pillowcases with crocheted edging that grandmother made. She taught me when I was 6 or 7 how to embroider. The art of the needle and thread, was probably the best gift she ever gave me, and I am still using it. My favorite gift is a 9 patch scrappy quilt my sister made for me in the early 1980’s. It’s primarily reds, which is my favorite color! Thanks for the opportunity to win these great products. I received a Sunbonnet Sam quilt from my aunt on the birth of my son. It is just precious. After 45 years I passed it along to my great grandson. My favorite handmade gift was a dress for the Prom. At that time, very feminine, long dresses were the thing. Mine was pink satin and lace. I still have it, packed away in a garment bag. Still using it 15 years later! One of those pin cushion / thread catchers. Sits next to my machine. Love it! My favorite gift was the little foot prints of my new grandson. It hangs in my sewing room where I am most of the time, and I see it there all day. I just love it…..and it’s as unique as my grandson! My grandma knit me a tiny stocking as a tree ornament and I love seeing it hanging on the Christmas tree. She taught me how to knit. A scrimshawed pin from my late husband. My great grandmother made me a small doll quilt on an old treadle sewing machine, that was my favorite gift ever received. A handmade embroidered scarf with a daughter prayer on it.. The best handmade gift was a quilt that my aunt made me shortly after I was diagnosed with breast cancer. It has the different colored ribbons for the different types of cancers. My dear friend makes Christmas ornaments each year and she writes a story to go with her ornaments. I have always looked forward to her Christmas story and ornament. Mug Rugs are my favorite last minute Christmas gifts to make.